This powerful week long training has its roots in Kundalini Yoga, in which you will dive heart-first into the foundational trainings of daily mantra, kriya yoga, meditation, and so much more! Together, we will strengthen the immensity of your presence so that you can show up for your students in a way that affects lasting change in the modern era. By learning to teach and uplift those in your community, you will leave with the tools to be a radiant light wherever you go, and to cause a powerful ripple effect among women. Level 1 KRI Teacher Training 200 hour is preferred but not mandatory. A CONCERT OF COMMUNITY, AWARENESS, PHILANTHROPY AND MANTRA MUSIC. Not only do we share a grand LOVE for horses, but we truly believe, without love there can be no freedom and without freedom there can be no love. When we are unbound from past and future we can find true LOVE in the World. It is our wish, to share a fragrance of this LOVE, together with YOU. Every year we focus our support toward a cause that speaks to our hearts. This year we support Dust Devil Horse Rescue Ranch that is located in Cedar City Utah. A non profit organization that has established a place to provide a safe sanctuary for horses to heal physically and emotionally from deep traumas. Through the 4th Zion Matrix "LIVE benefit Concert" we combine gracefully human, nature and sound to awaken deep innate wisdom and harmony. Qualities that help us remember why we came to Earth. We are trilled to have Ajeet Kaur as our music artist. Ajeet's music quickly found its way around the World. She released four albums of sacred music, which have been celebrated as #1 on i/tunes world chart. Ajeet and her band of four amazing musicians will blend ancient mantra with a fresh unique contemporary style. You don't want to miss it!! possessions as possible: True prosperity happens when our authenticity comes into this state of flowering awareness, where everyone has something unique and truly valuable to share. Come join and co-create a flowering connection to your destiny…. experience of everyday living. Let’s gather in sisterhood and rise together, by creating a new pattern of collective support for all to be successful, so that WE as women can radiate our true beauty and Grace. Come join! This retreat will be for a maximum of 8 women. Based upon the request. Atonka is offering a nice refresher class on the Swimming Dragon movement that is loved by so many. 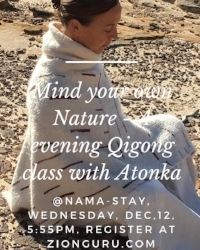 Join us for a rejuvenating evening at Nama-Stay. The Swimming Dragon offers a tremendous benefit to your well-being and promotes long-life for those who seek it. This class is for EVERYBODY, including people who have never done Qigong or Yoga. Through this class you will learn how The Swimming Dragon will help enhance both energy and blood circulation. You will feel and experience how it beautifies the skin, helps regulate appetite, invokes natural weight loss, regulates and improves hormone balance and posture, rejuvenates spinal and kidney fluidity, while reaching healthy bright brain function. It is Atonka’s wish to share this movement with you as a tool to help you reach remarkable benefits and natural healing potential in everyday life. Please park in town and walk to Nama-Stay. We have limited parking available. Wear comfortable clothing and bring your own Yoga mat. We will serve a nice Tao Tea afterward. We are thrilled to have Aykanna back in Springdale - ZION! Sukhdev and Akah a MUSICAL MANTRA DUO whom have inspired thousands of lives through their authentic music and lyrics. Combining their 40 year experience in walking and chanting a profound spiritual journey; they create a groundbreaking soulful sound medicine to uplift others to their purest destiny. Every chant is a rhythmic seed that calls each one of us into our greatest self to be and become that which brings peace to all life on Earth as well in the Cosmos. Chant your WAY to ONENESS is a 3 hour mantra evening voyage. A musical fusion that is heaven for your senses. Tune in, chant, learn, pray, surrender, and most of all enjoy a luminous sound evening at Nama-Stay. Come join!! Lets GO! Combine your Zion visit with a rejuvenating Kundalini BreathWalk! We all walk and breathe. BreathWalk is a way to revitalize your Body, Mind and Spirit. During BreathWalk you add focused attention along with patterns of rhythmic breathing and sound. If you are tired, it will give you a quick-start energy booster. If you need rejuvenation, it will fill your energy reserves. If you need a calm down moment, it will give you an inner calm. If practice regularly and sincerely, it will give you abundance. BreathWalk helps you access your innate powers of self-care, bringing forward positive, mood elevation and enhanced healing. You can take BreathWalk into all areas of your life. No previous experience is necessary. Meeting Point: Arrive 5 to 10 minutes early. Meet at Flagpole at Zion Canyon Visitor Center. Must register/pay at Zion Guru no later than 12 hours before scheduled hike. Join us in Springdale, Utah for our second annual Zion Aerial Arts Retreat! Our Zion Aerial Arts Retreat offers a depth of knowledge, rigging expertise, and one-on-one experience which empower both newcomers and intermediate aerialists in a 4 day, 3 night retreat setting. Lodging and aerial workshops are located at Nama-Stay Vacations and Retreats. Come to the high mountains of Utah…At the most glorious time of the year for a transformational course in Gong Therapy and Yoga! A concert of community, awareness, philanthropy, dance and LIVE music. Zion Guru hosts local Yoga teachers for inspiring ways to begin your days in Zion. A mix of daily on-site classes held at our location and energizing Yoga hikes combining cardio, asanas, and meditation. We are excited to host the 2nd annual Zion Matrix LIVE Concert, Friday September 2th, from 7-10pm @ the stunning outdoor O.C. Tanner Amphitheater in Zion National Park, Springdale UT. Join us for a fantastic adventure in the aerial arts! Remote Location Aerial Arts Photoshoot with Vertical Art Dance! Perhaps you have seen one of our remote location performance videos, we now invite you to join us! Have your photo taken in a beautiful remote location! Let our photographers capture the beauty of your art and the amazing backgrounds of Zion Nation Park and surrounding areas. We offer safe and modern remote rigging by our team of qualified and experienced professionals. JOIN US AND VERTICAL ART DANCE FOR AN ADVENTURE IN THE AERIAL ARTS! Aerial arts is a powerful, emotional art form communicating through yoga and acrobatics on suspended silks. Our Zion series workshops offer a depth of knowledge, rigging expertise, and one-on-one experience which empower both newcomers and intermediate performers in a 2- or 3-Day intensive workshop setting. Click here for more details. How is compassion similar and different to empathy? The New Moon in Aquarius offers us a sublime opportunity to see beyond the obvious. Through a portal of specific Kundalini Activation in combination with the New Moons perfect timing we will “Start! and the Pressure will be Off! Vibrate the Cosmos and the Cosmos shall clear the path.” We are in an important timeline of manifestation that began January 9th and culminates July 19th. Join us in the sacred, quiet space of Nama-Stay, where our Meditative Self-Exalted experience will be amplified infinitely; the Sound of the Gongs will transform us, and we will know: I Am, I Am! Open to one and all. No previous Yoga experience necessary. Workshop will consist of meditation, movements, mantra, and gong sound healing. $20 February 8th. Donations accepted! Tickets available online @www.sagehillshealing.com below. Tea and cookies served afterwards along with an opportunity to visit with Mandeep and All. Nama-Stay is a place of great joy and practice. We welcome all to discover the magic of Kundalini Yoga - the study, practice and release of latent energy stored in everyone's spinal cord and when activated, readily heals, enables, and elevates you to the highest level of fitness and health. Mandeep Kaur facilitates Hatha and Kundalini Yoga workshops, teacher trainings, and public classes via her Om Ranch and Sage Hills Healing Center in Cedar City, Utah and guest teaches at Nama-Stay seasonally.